Many of our customers work in areas where a small spark could endanger dozens of workers. Labeled “Hazardous Locations”—or “Hazlocs”—these work areas are known to house conductive or explosive substances either very often, or simply on occasion. Oil refineries, coal mines, and flour mills are just a few places where even a small flame would be the last thing you’d want. This video perfectly illustrates that point. Because of the volatility of these environments, the equipment used needs to meet certain safety criteria in order to prevent disasters. And since different work environments vary in the type of hazardous substances that are present, as well as the likelihood of these substances being present, different work places require varying levels of safety measures to be built into their equipment. There are a couple of organizations that have classified different types of Hazlocs, which helps businesses know the level of safety measurements that their equipment should meet. 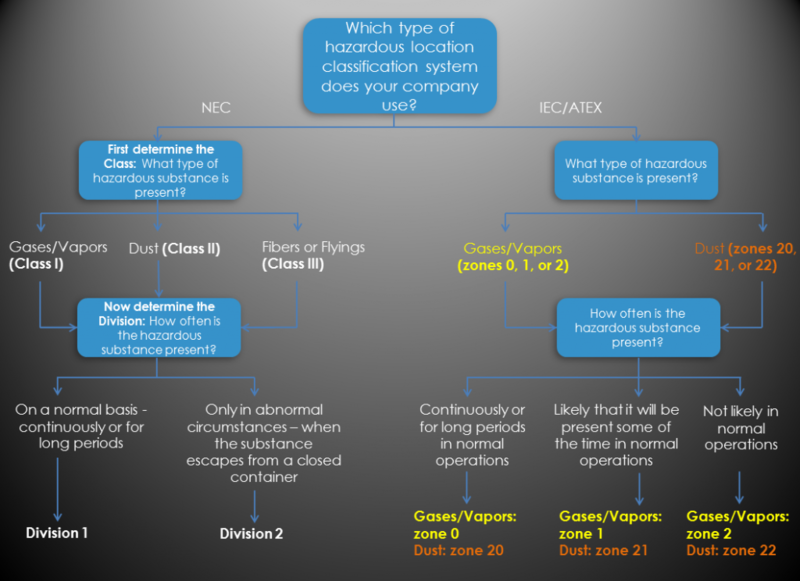 In the United States, companies generally follow the classifications laid out by the National Electric Code (NEC), which places Hazlocs into classes and divisions. Most of the rest of the world follows classifications detailed by the International Electrotechnical Commission (IEC), which classifies Hazlocs by zones. Europe has its own classification system based on the IEC classifications, known as ATEX. So, the question is: what classification does your work environment fit into? And subsequently, what type of equipment do you need in order to assure workers’ safety? Oftentimes, people purchase equipment (at a premium) with more safety measures than they need for their work environment, resulting in unnecessary expenditures. The following guide should help you gain a basic understanding of what classification your work area fits into, and what type of equipment you’ll need as a result. This is just a very basic guide, and it is important to consult with your company’s safety manager and research on your own before deciding on equipment. 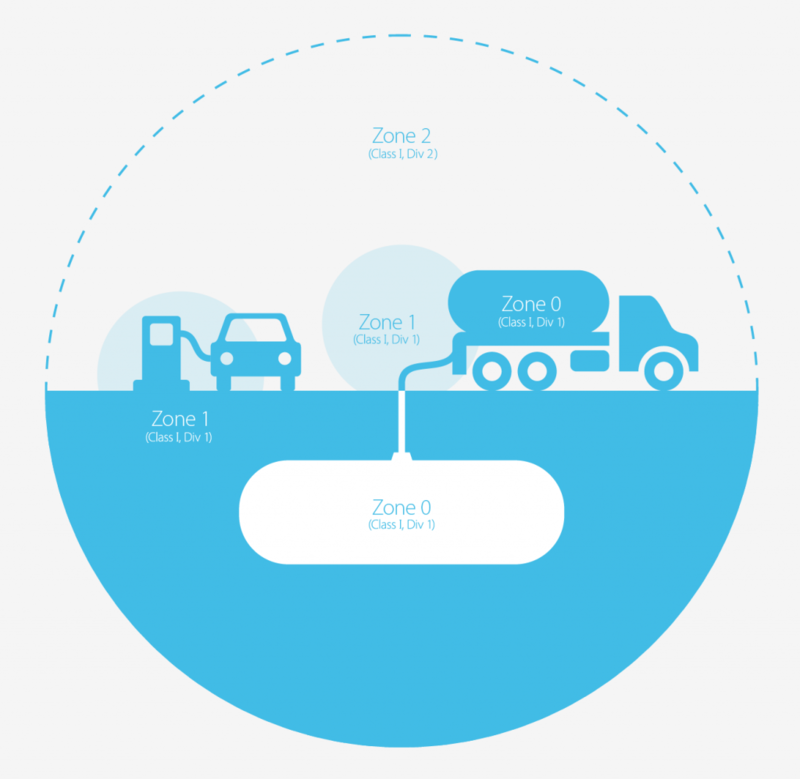 Here is an example of how the NEC and the IEC classify specific areas of a gas station. As you can see, the IEC uses zones, and the NEC uses class and division. In the image above, it’s important to note that in the case of mobile equipment, oftentimes you can use a mobile device with a less stringent safety certification than the Hazloc classification would suggest if the mobile device is only used for brief periods at a time in the Hazloc. This of course is up to your local safety compliance expert (governmental/corporate) to determine whether this is possible or not. At Juniper Systems, we specialize in building Class I, Div 2 certified handhelds. So if you work in a Hazloc with flammable gases/vapors, where these substances could potentially be present, check out our Mesa® and Archer 2™, which both offer Class I, Div 2 certifications. To learn more about any of the above topics, feel free to contact us or comment below.